We are a statewide, grassroots coalition of individuals with disabilities and/or chronic illnesses and their families. We believe that supports for individuals and families can be more flexible and better designed to respond to the actual needs people have. We are actively organizing families and individuals to use the power of our numbers to effect positive change. 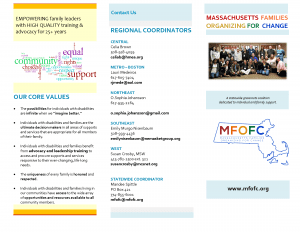 MFOFC provides information, leadership training and support to families, and also has regular regional meetings for families and individuals. Each region of Massachusetts has representation at the statewide Steering Committee. 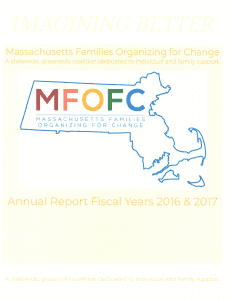 Members of MFOFC have written and passed legislation to create statewide policy and practice for individual and family support. We have sponsored various conferences, workshops and forums to inform and educate individuals, families and community members about advocacy, services and local, state and federal resources. Our vision is one of empowerment for individual and family support that includes planning, choices and decision-making. To provide sustained advocacy and leadership training in pursuit of high quality, individualized community support and service options, including family support, for people with disabilities and their families. Individuals with disabilities and families are the ultimate decision makers in all areas of supports and services that are appropriate for all members of their family. Individuals with disabilities and families benefit from advocacy and leadership training to access and procure supports and services responsive to their ever-changing, life-long needs. The uniqueness of every family is honored and respected. Individuals with disabilities and families living in our communities have access to the wide array of opportunities and resources available to all community members.